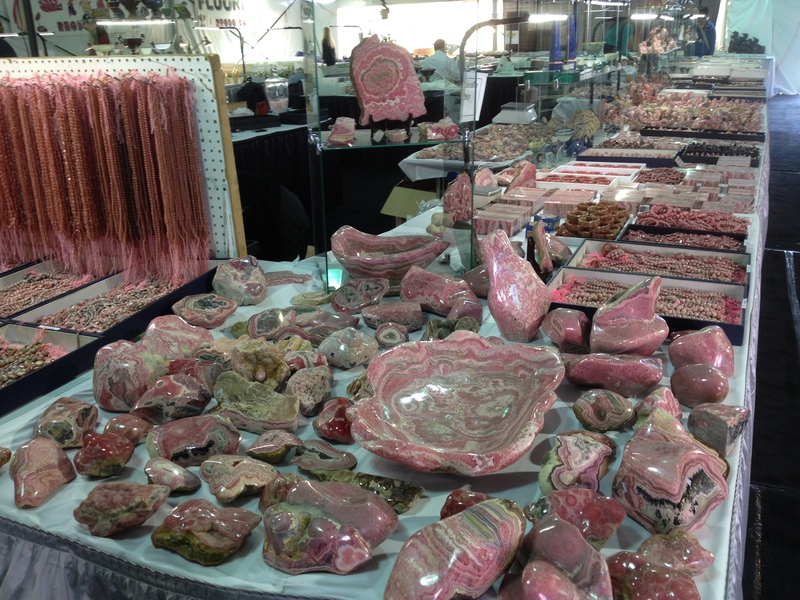 So here I am in Tucson, sorta attending a gemstones show – the largest in the world, with literally thousands of vendors – along with my bead store business family relatives. I’m here for the family part of it, the warmth part of it, the leave Washington County on something other than a school bus of teenagers part of it … more than the gemstones experience. It is a lot of walking and standing, so on this first day, I did a half day and went back to the hotel to deal with my swollen knee and to write stuff like this! It really is quite a sight to see crystals and gemstones from literally all over the world … and in all sizes – from the seed bead size of a sesame seed, to crystals actually bigger than a human. 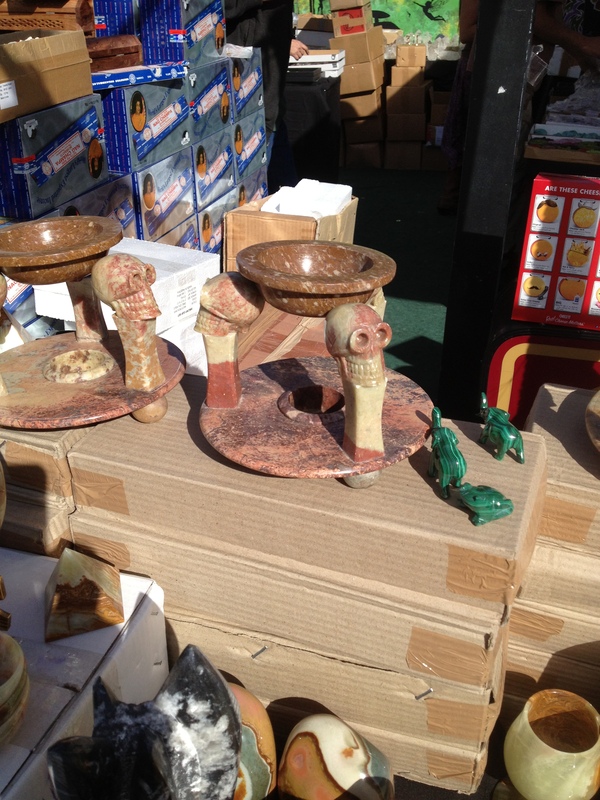 There are fossils and meteorites and every shape and size of both raw and polished stones. But one thing that quite amazed me was the popularity of skulls. 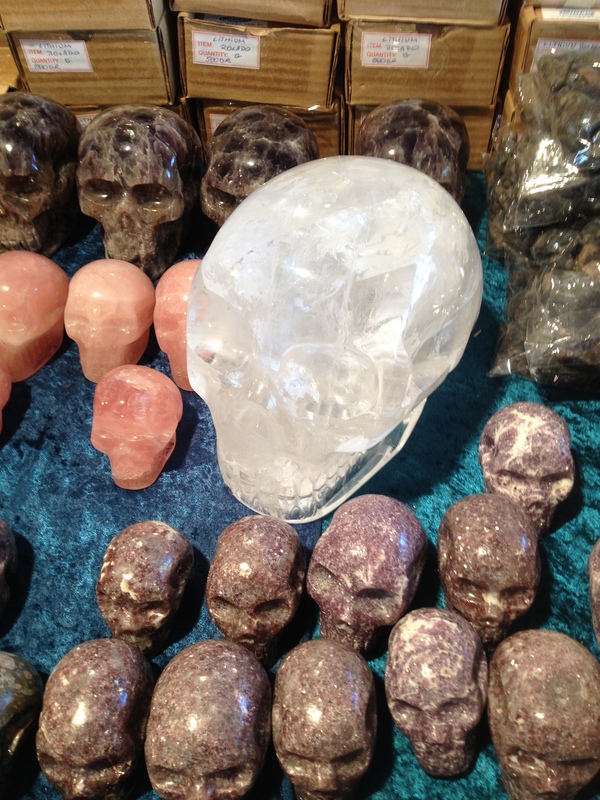 You can buy carved stone skulls in every size from beads to larger than life – and you can get them in just about every type of gemstone or color. Dozens upon dozens of vendors were selling them – many of them also wearing clothing with skull prints of varied sorts. But why? Why skulls? It is a trending item even in the fashion world. I did some research to find some answers. There were a lot of hits on sites that were asking and seeking to answer the same question. There is no definitive simple answer. A more thoughtful writer questioned it in a way that has gone through my mind, “But what’s it all about? Down through history, skull iconography has been used in campaigns by invading and dominating forces to instill fear into their enemies, from the Romans, to Vikings, Cannibals, to Pirates, to the Nazis, even to Bikers and Metalheads in the latter half of the 20th century. All fairly antisocial types! So why is the fashion world trying to associate with this? That is sad, if indeed this last suggestion is the reason … and I think it had some merit and validity. The generation is yet to be found that can find happiness and contentment in life apart from a vital relationship with God through Jesus Christ. Without that, there is that God-shaped vacuum spoken about by Pascal. This is a timeless truth about the human condition. This entry was posted in Devotional, The Crazy Culture / Odd Stories and tagged skull popularity, skulls in fashion, trending skulls. Bookmark the permalink. ← We Are Not Ranking Well These Days! Skulls are a part of the “Dia de Los Muertos” (Day of the Dead) celebration in Spanish cultures (the holiday is celebrated Nov. 1 and 2, and timed to coincide with the Catholic Holy Days of All Saints’ Day and All Souls’ Day). In Bolivia, May 5 is “Dio de los natitas,” (Day of the Skulls), a holiday in which family members celebrate with the bones (now just the skulls) of their deceased ancestors. They keep the skulls in their homes to watch over them and protect them, they decorate them with flowers, and they take them to the cemetery for a special Mass and blessing. For countries with Roman Catholic heritage, skulls tie into All Saints’ Day and All Souls’ Day, as a reminder of the death of earthly life and the rebirth into spiritual life through Jesus Christ. Anthropologists suggest that people keep and relate to skulls because they look the most “human” after death and decay — a human skull still has teeth and eyes and a nose socket, relating to us on a visceral level. A femur, on the other hand, is just a bone. So there is that.